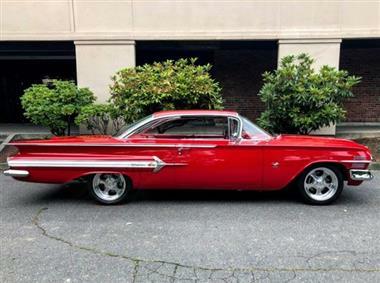 1960 CHEVROLET Impala in Arlington, TX for sale. 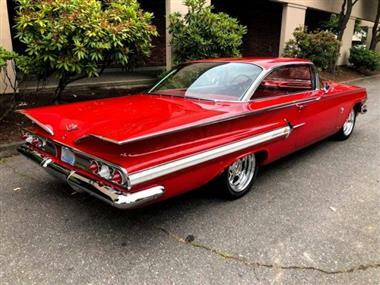 1960 Chevrolet Impala I truly don?t know what to say here about this California originating, one-owner car. The pictures cannot do it justice and any description will pale in comparison to seeing it in person. It is hands down one of the finest frame-off, rotisserie restorations I have ever seen and that has been echoed nearly 100 times in the few days it has been here in the showroom. When I say the car is flawless, that isn?t just some blanket statement people give to a car?it truly is. The following is a detailed description but to fully list everything would take more space than we have here. 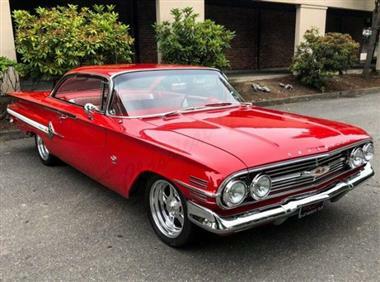 It is powered by a 409 Stroker (taken to 484 cubic inches) that is based on a 1964 truck block with 409 aluminum heads (ported/polished), Erson cam shaft, dual Edelbrock carburetors (650CFM), Edelbrock intake manifold (ported/polished), custom Jerry Jardine headers that have been ceramic coated, March serpentine belt system, March custom cross member for alternator support, chrome alternator, chrome power steering and water pump and a 700HP rated Be Cool radiator with twin 15 inch electric fans. 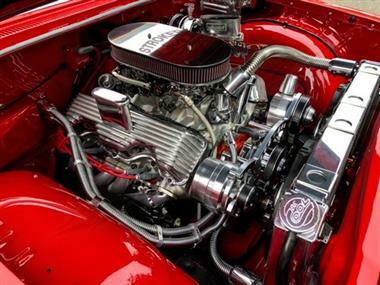 All of this contributing to the engine putting out in excess of 600 horsepower that the Richmond 5-speed with Hurst shifter and heavy duty drive line handle with ease. With the gearing at 3.50 in the Curry 9-inch rear-end this car is a rocket ship! The engine bay has been prepped and painted better than the bodies of most show cars you will ever see. The custom dual exhaust has an electronic baffling system to go from throaty tame to almost straight pipes at the flip of a switch. Think of the fun you can have with your local constable with that! The stopping power comes from a top-of-the-line Wilwood power disc brake system. The exterior has been meticulously prepped and painted in a custom blended red paint. There is not a single blemish or wheel stroke on the finish and it is so deep and clear you can see yourself in it. All of the stainless bright work was individually removed, straightened to perfection and polished to shine better than most chrome. 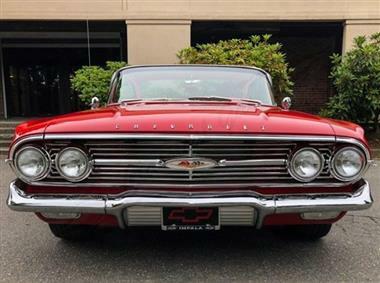 Speaking of chrome, like the rest of the car, it is absolutely perfect. The frame has been media blasted and powder coated and has a ChassisWorks front-end with coil over and tubular upper/ lower A arms. She sits on 17-inch chrome Budnik wheels and new Toyo high performance tires. Inside the interior is nothing short of stunning as well. The dash has been painted the same color as the exterior and it contains a full set of gauges plus a Retro stereo complete with Bluetooth and 10-disc changer tucked away in the hidden compartment in the trunk next to the battery. All of the chrome inside is new with not a single blemish including the horn on the tilt steering wheel. 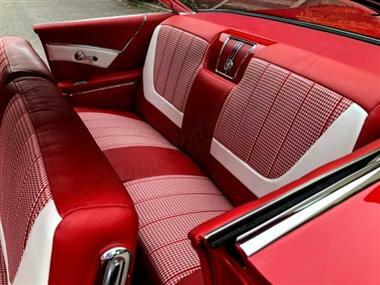 The seats are a piece of art in their own right done in supple leather with traditional looking hounds tooth cloth in the center. All of the glass and trim on the car are also brand new. The trunk had no expanse spared either and is done to the same quality as the rest of the car down to aforementioned hidden compartment seamlessly integrated in. You may find an equal restoration out there in our community but you will not find one that surpasses this in any way, shape or form. It is a simply phenomenal automobile that would cost easily over $175,000.00 to duplicate at our shop. 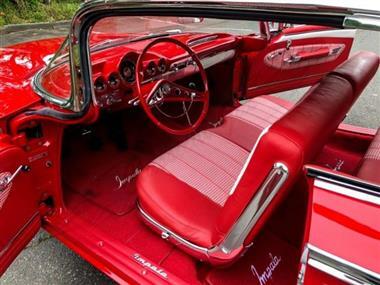 There has not been even a nut, bolt or screw on this Impala that did not receive the same attention to detail as everything else. If you are one who looks for perfection this is it. We are offering this car for only $74,900.00! This car is being represented for a collector in Seattle, Washington area.